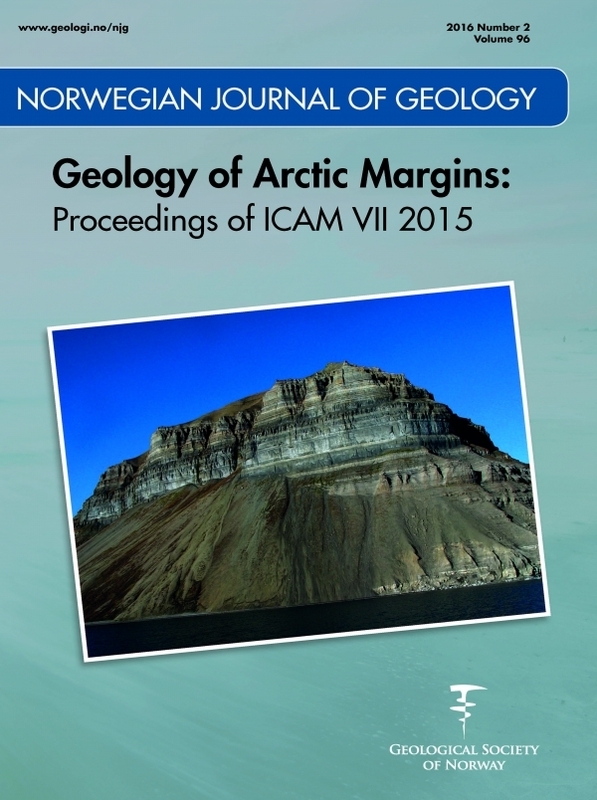 The poorly studied Alpha–Mendeleev Ridge of the Amerasia Basin of the Arctic Ocean is covered by a large magnetic high and interpreted to be part of the Cretaceous High Arctic Large Igneous Province (HALIP). At the north coast of Ellesmere Island, in the Yelverton Bay area, this characteristic magnetic high overlaps the shelf and the coastal area. Results of aeromagnetic surveys, geological fieldwork, geochronological, geochemical and Sr–Nd isotope analysis were combined to study the tectonic history of this part of the Canadian Polar margin. The basement, consisting of metamorphic rocks of the Pearya Terrane, was strongly affected by HALIP-related magmatism that is responsible for characteristic positive magnetic anomaly patterns. A broad magnetic high that can be traced to the Alpha Ridge covers the shelf and coastal areas of Yelverton Bay. It is caused by a voluminous intrusion into the continental crust at a depth of ca. 6–15 km. A chain of small positive magnetic anomalies crosses Wootton Peninsula from SW to NE and then curves into a NNE–SSW trend. It follows the coastline onshore and offshore and superimposes the southern and eastern margins of the broad magnetic high. On land, the anomaly chain covers fault-bounded outcrops of the Wootton Intrusive Complex (WIC) and the Hansen Point Volcanic Complex (HPVC), indicating that the entire anomaly chain is associated with a volcanogenic sequence. Rhyodacite that forms large parts of the HPVC east and west of Yelverton Bay extruded between c. 104 and 97 Ma (LA–ICP–MS U–Pb zircon ages). It originates from a tholeiitc suite and is probably genetically related to the deep intrusion. The HPVC together with the rhyodacite has an age range of c. 104–74 Ma and includes the mildly alkaline WIC (93–92 Ma). The northern coast of Ellesmere Island shows some characteristic features of a magma-rich rifted margin indicating an extensional evolution parallel to the North American margin between the openings of the Canada Basin and the Eurasian Basin.